we saw that PHP 5.4 may write progress information about file uploads into special elements of the $_SESSION-array on the server. We discussed that the PHP session must already be established before the upload process is started by the web client via an Ajax process. 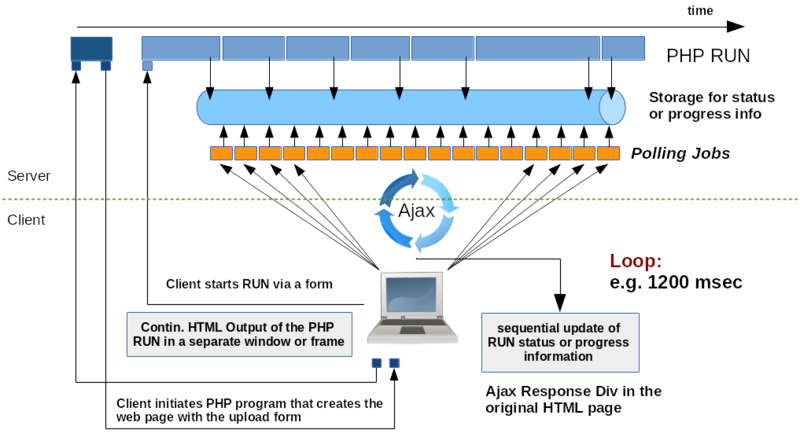 Furthermore, we have understood the following: The PHP target program which is called by the original Ajax request - i.e. the request that starts the file upload - will not be of any use for sending progress information about the file transfer to the client: The code execution of this PHP program only starts after all POST data, including all file data, have completely been transferred to the server. These periodic jobs "poll" the progress information from some storage on the server - in our case from the $_SESSION array. Therefore, we call the periodic jobs "progress polling jobs". A status monitoring with polling jobs has advantages and disadvantages. One advantage is that it does not depend on special HTML 5 properties or a special jQuery plugin. Another advantage is that we get complete control over what data are exchanged between server and client. One disadvantage is - as we shall see - that we may need to dynamically adapt the polling time interval to the measured rate of the file transfer. A further potential disadvantage is that it may become difficult to react to problems occurring during the ongoing transfer of the file data. We shall have to come back to this point in a later article. However, in the present article we ignore potential problems and sketch the basic outline of the polling control. Obviously, we have named the PHP target program collecting status data "check_progress.php5". In our very basic example the form's only contents is a hidden input field whose value is the identifier for the upload process. Note: In a real world example it may be necessary to send more information to the server - especially for error or problem handling. Our simple form can easily be extended by more variables to be sent to the server. Our "progress" DIV encapsulates the elements of the lower part. There is no need to discuss CSS properties here. // did the last poll job return ? For the meaning and purpose of the GOC see also a comment to the second article of our series. The CtrlO methods should not require any special knowledge about the internal structure of the GOC. The CtrlO methods should still work even if several CtrlO objects of the same type are created (full encapsulation). The latter may become relevant later; e.g. if you want to upload several distinct files for different purposes on the same web page. Note that we call a method "register_events()" to register methods for handling events occurring for elements of our DIV container. This is a central element of a CtrlO. How often is the progress information in the $_SESSION array updated on the server? What is the update frequency on the server compared with our polling frequency? The latter value min_freq has to be an integer. Please, keep in mind that some of the logic we later on implement in our CtrlO only makes sense only if the polling interval on the client is always chosen to be somewhat longer than min_freq on the server. Now we consider an important question about the whole approach: Can a constant polling interval lead to trouble? If our connection and the data transfer are very slow we may not see any transfer progress for some polling intervals due to the consequences of the php.ini parameters named above. The progress values may not change although file data arrive continuously - but slowly - at the server. This may give us a false impression of what is going on and it may impact program decisions whether to stop the polling due to a (falsely) detected potential error situation. In case of a small data transfer rate we obviously should use a relatively long polling time interval to see progress between two consecutive polls. Already this consideration indicates that we need an adaptive polling time interval. Furthermore, we also need to deal with situations where the server responds slowly - i.e. with a period longer than our polling interval. A reasonable approach in such a case is that we should only send a new polling job to the server if we already have received a response to our last polling job. If this is not possible with the chosen polling interval we have to change it. We shall come back to both points below. The method triggered periodically is obviously one of our CtrlO object - "progr_submit". This method triggers the submit event for our new form which in turn is registered with a CtrlO callback method "poll_progress". To delegate the responsibility for the submit event to a local method of the CtrlO we used jQuery's proxy mechanism. As we used $.proxy() in a previous article of this series we are already familiar with this approach to encapsulate all control mechanisms inside the local CtrlO object. In addition we introduced a parameter "setStartTime" that distinguishes between the start of a file upload and later calls of the method "get_status_by_ajax(setStartTime)". A closer look shows that we called the "progr_submit()" method in a special way: Why do we need to attach the ".bind(this)" method to the callback function? would not work for us because the "this" context would point to the global object when the callback is invoked. Both closure approaches discussed in the named articles are nice - but actually not necessary for present browsers. Note that the brackets "()" after the method name are required in this type of approach (at least in FF)! However, you may set a big question mark behind such a program design and its implied consequences because explicit knowledge about the usage of the "Upl_Progr" class in the GOC is required and the whole approach will only work with singletons. Nevertheless: Our overall design of CtrlOs naturally deals with singletons and a GOC dispatcher - so this solution is somewhat noteworthy. It violates, however, our 2 rules set above. "bind(context)" sets the context explicitly to the local object from where setInterval is called and will even work in IE > 9. Note that in this approach we do not need to invoke any specific global knowledge about the GOC and that it is not restricted to singletons! Where from do we start the time loop for polling? The other statements set values to other variables used in the CtrlO "Ctrl_File_Upl" later on. Not setting the context for the "this" operator is a common source of errors and mistakes when using callback methods to handle status events or responses in course of Ajax transactions. Of course, we could have included all parametrization and the call of the Ajax target program in one statement as in our last article. The usage of $.post() in our example has no other reason than showing and discussing an alternative. The parameter for the type of the return data had already been set to "json" in the constructor function. Due to a mail of a reader I like to point out that using a combination of $.ajaxSetup() with $.post() may have disadvantages because $.ajaxSetup() sets standards for all coming Ajax transactions. Certainly, you do not want the context of all future Ajax transactions point to "Ctrl_Upl_Progr". So, you would have to take care to reset this value as required later on. If you absolutely want to use $.post(), a much more intelligent solution would therefore be to use it in the form "jQuery.post([settings])" with "settings" representing an Ajax key/value parametrization object. See http://api.jquery.com/jquery.post/#jQuery-post-settings. Or just keep using $.ajax() here, too. Counting the number of executing "progress_poll()" is going on unconditionally until a maximum of allowed calls is reached. This helps to avoid an unlimited time loop. Note in addition that we do not submit a new job if the last one did not yet return some answer. If we experience such a situation we adapt by extending our polling interval slowly but systematically until a maximum value is reached. Thereby, we react adaptively to slow servers or slow connections. Now you may ask: What happens if the upload progress is going on slowly and the maximum allowed numbers of polling calls is too small? Good point! We will react to this by changing the maximum allowed number of poll calls when dealing with the answers of the server - but only if some upload progress is still measurable. See below. // error detected by the server ? // Shall the associated time loop be stopped ? this.msg += "<br>File upload is progressing!<br>"
We first transform both the uploaded bytes and the file size to KBytes or MBytes. The end time information is also used as a signal to stop the time loop for polling jobs on the client. This means that it will only be sent as a non blank string if our PHP polling program finds that the upload has finalized. We just saw that it may become essential for our polling based progress monitoring to determine whether there is any progress at all. However, due to the parameter settings for the update interval of the progress information a too small polling period may lead to the false impression of zero progress over one or several polling intervals in case of slow connections. Furthermore, we only do something with our period if the polling time interval deviates more than 10% from the ideal time interval - and we never go below an interval of 1200 msec. In addition we limit changes to a maximum of 20% of the present value to avoid a jumpy behavior during the first steps of the transfer when the rate may change grossly. Thus, we try to change the polling time interval rather smoothly. We leave it up to the kind reader to improve our simple adaption algorithm. I may say, however, that it works quite well for my aDSL and vDSL connections where reasonable rates are possible. I do not regard the lower limit of 1200 msec as a problem: If the whole file is loaded in one polling interval - hey, I am happy. Monitoring is needed for slower connections. This kind of passing a parameter to a callback works in FF and Chrome. Unfortunately, it does not work in MS IE, Version <= 9. Fortunately, our method "get_status_by_ajax()" already takes care of an undefined function parameter. As indicated some received progress information is displayed in special DIV containers; the percentage information may be used to simulate a progress bar by a dynamical change of the width of some colored DIV. Some other messages from the server are, however, handled by a special CtrlO for a message display and formatting area on our web page. The reader may design such an area by himself and write a related CtrlO. In our example we indicated the use of a message handling CtrlO by the statement "this.SO_Msg.show_msg(0, this.msg);"
Note that we did not discuss any handling of error messages from the server yet. We leave this to the reader. You may use a boolean element "json_progr_result.err" of the JSON response object to indicate an error and its type - and react properly to it. We do not elaborate this here. we shall have a look a the PHP side. Inzwischen hat einer der 1920x1200 Schirme an besagtem System nach vorhergehender Alterschwäche den Geist aufgegeben und wurde durch einen weiteren Dell U2515H ersetzt. Nachzutragen ist, dass auch eine Konfiguration mt 2 Dell U2515H mit je 2560x1440 px an 2 HDMI-Anschlüssen und einem 1920x1200 LCD an einem der DVI-Anschlüsse der Graka einwandfrei funktioniert. Zumindest bei Verwendung eines aktuellen proprietären Nvidia Treibers. Voraussetzung sind - wie im letzten Artikel ausgeführt - gute, aktuelle HDMI-Kabel mit 4K-Unterstützung (und hinreichender Länge - in meinem Fall 2m und 3m). 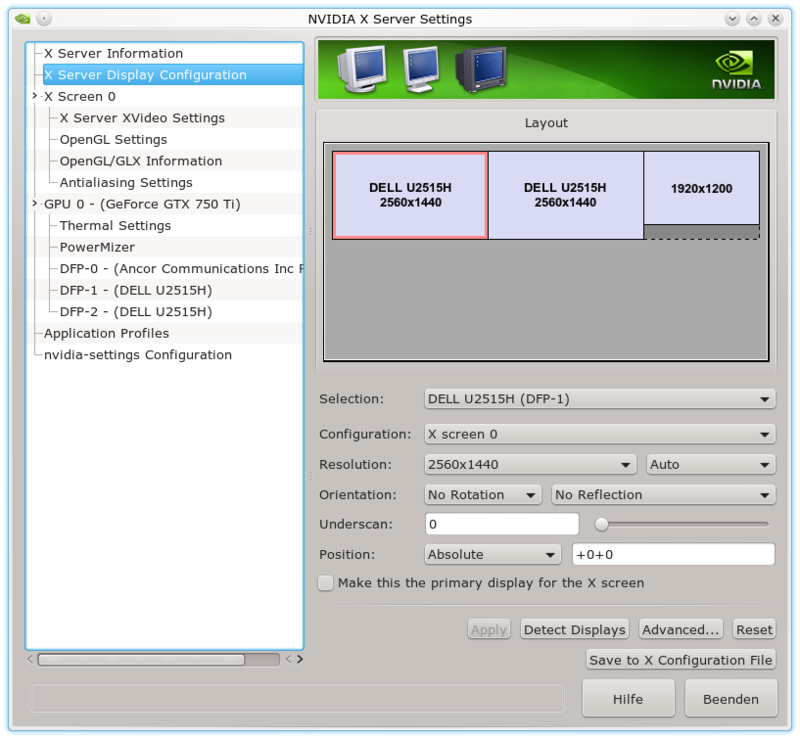 Ich konnte inzwischen auch die Konfiguration aus 2 Dell U2515H per Display Port und einem 1920x1200 Schirm per DVI an einer Nvidia GTX 960 testen. Funktioniert problemfrei! An einem unserer Entwicklungssysteme nutzte ich bisher zwei 24 Zoll IPS-Schirme mit einer Auflösung von 1920x1200. Vor einigen Monaten hatte ich zudem meine alte Nvidia GTX 460 Grafikkarte gegen eine GTX 750 TI von Gigabyte ausgetauscht. Letztere bietet aus meiner Sicht einen annehmbaren Kompromiss zwischen 2D/3D-Leistung und Preis - zumal ich kein Interesse an PC-Spielen habe. Die Umstellung ging problemlos - soweit man mal von kleineren Problemen der proprietären Nvidia-Treiber in der aktuellen KDE 4.14 / KDE 5 Umgebung absieht (siehe die Off Topic Anmerkungen am Ende des Artikels). Nachfolgend möchte ich darstellen, dass und wie man diese Konfiguration unter Linux um einen DELL U2515H in dessen nativer Auflösung erweitern kann. Insgesamt ergibt sich damit ein Linux-System (in meinem Fall unter Opensuse 13.2 und KDE) mit 3 Schirmen und einer (virtuellen Xinerama) Screenbreite von 6400 Pixeln. Gigabytes GTX 750 TI hat 2 DVI- und 2 HDMI-Schnittstellen, aber leider keinen Display Port. 4K Auflösung wird auch nur in Spezialkonfigurationen unterstützt - die Schirme müssen hierzu einen bestimmten Modus mitmachen. Eine Auflösung von 2560x1440 bringt die Karte laut Spezifikation aber sehr wohl zustande - zumindest an einem Schirm. Über das Fehlen einer Display-Port Schnittstelle hatte ich beim Kauf nicht weiter nachgedacht. Da immer mehr Schirme jedoch keine DVI-Schnittstelle mehr anbieten, ist das ein Punkt, der künftig meine Graka-Entscheidungen sehr viel stärker beeinflussen wird. Jetzt hat einer meiner älteren Schirme - ein von mir geliebter alter Samsung 244T mit S-PVA Panel (Samsung hat danach nie wieder so gute Monitore gebaut!) - eine Macke: Der Schirm kommt nach einer längeren Abschalt-Phase durch KDE's Powersaving Funktionen u.U. nicht mehr hoch. Wir hatten solche Probleme schon früher - vermutete Ursache sind defekte oder altersmüde Kondensatoren der Schalt-Elektronik des Schirms. Das Panel selbst ist völlig OK. Zu anderen möglichen Ursachen s. die Off Topic Anmerkung weiter unten. Eine weitere Reparatur des Samsung lohnt sich jedenfalls nicht. Grund genug, über einen neuen Schirm für meinen Linux-Arbeitsplatz nachzudenken. Der hohe Kontrast der Standardeinstellung ist mir persönlich zu intensiv - aber das kann man sehr gut manuell nachregeln - ebenso wie die Helligkeit. Die Winkelabhängigkeit von Helligkeit, Farbtreue, Kontrast des Bildes halten sich in den Grenzen dessen, was man von einem besseren IPS-Panel erwarten kann. (Mit der Qualität eines PVA oder MVA Panels kann sich ein IPS Schirm in diesem Punkt von Haus aus nicht messen.) Ja - es gibt auch einen typischen IPS Glow - in vertikaler Richtung ausgeprägter als in horizontaler - besonders wenn man von unten nach oben auf den Schirm sieht. Es ist ein flächiger, weißlicher Effekt - er führt aber interessanterweise nicht zu Farbverfälschungen, wie ich sie schon bei anderen Schirmen gesehen habe. Der Effekt ist subjektiv geringer und auch homogener als bei einem ASUS 248PBQ. Die Entspiegelung des U2515H hätte für meine Gefühl besser sein können; eine helle Tischplatte oder ein eigenes weißes Hemd wird im Schirm etwas verwaschen wahrnehmbar sein. Die Entspiegelung ist geringer als bei aktuellen ASUS Schirmen. Aber das ist vielleicht Geschmackssache und nicht jeder mag die Körnigkeit stark entspiegelter Schirme. Die Homogenität der Ausleuchtung ist zumindest bei meinem Exemplar recht gut; da habe ich im Netz schon anderes gelesen. Subjektiv meine ich, einen minimalen Helligkeitsabfall zu den Rändern links und rechts feststellen zu können - hier schlägt vielleicht aber auch schon die Winkelabhängigkeit des Bildes in Kombination mit der Breite des Schirms zu. An die Bedienlogik und die Touch-Tasten konnte ich mich relativ schnell gewöhnen. Die manuelle Farbregelung ist für mein Gefühl zu sensibel - hier schlagen nichtlineare Effekte schnell zu - aber es ist durchaus möglich, die Farbeinstellungen manuell allein über die Steuerungsfunktionen des Schirms selbst anzupassen. (Eine echte Kalibrierung ersetzt das nicht). Schlechter als bei aktuellen Asus-Schirmen im Bereich zwischen 300 und 500 Euro ist die manuelle Bild-Regelung des Dell in keinem Fall - eher besser. 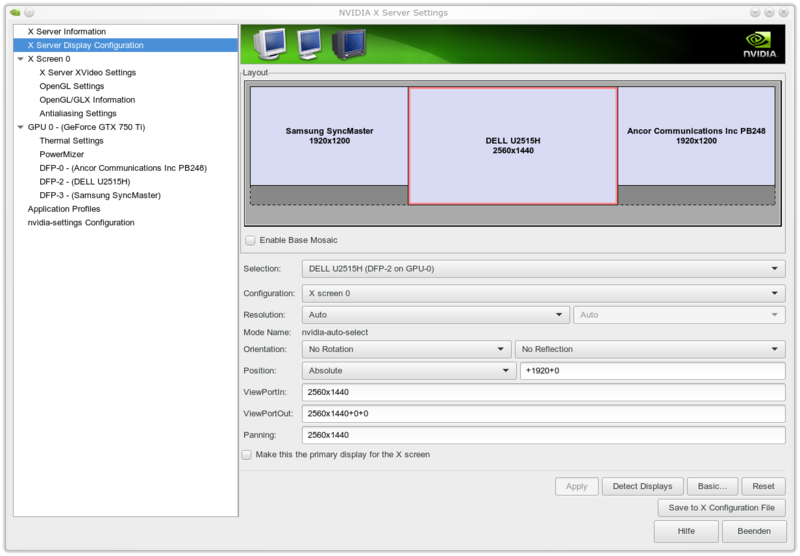 Zudem bietet Nvidias Applikation "Nvidia X server Settings" für Linux die Möglichkeit pro Schirm individuelle Einstellungen der Farbkanäle vorzunehmen. Ein Manko des DELL : Eine stufenlose Gamma-Regelung ist leider nicht möglich. Hier muss man auf Möglichkeiten der Grafikkarte zurückgreifen. Relativ beeindruckend ist die Darstellung von Grauverläufen in Testbildern. Ich konnte bei normalem Kontrast bislang keinerlei Streifigkeit erkennen. Bzgl. Spielen habe ich nur Alien Arena in verschiedenen Auflösungen angesehen. Kein akutes Problem erkennbar. Ich habe aber keine Ansprüche und spiele aus Zeitmangel so gut wie nie. Videos: Von meiner Seite kein Problem erkennbar. Kein DVI-Anschluss für den Dell U2515H - funktioniert HDMI mit einer Auflösung von 2560x1440? Das größte Problem stellte für mich bei der Kaufentscheidung die hohe Auflösung in Kombination mit der Tatsache dar, dass der DELL U2515H nur HDMI und Display-Port-Anschlüsse, aber keinen DVI-Eingang besitzt. Im Internet hatte ich vorab über erhebliche Probleme anderer Leute gelesen, die hohe Auflösung von 2560x1440 bei diesem und vergleichbaren Schirmen über HDMI (gem. 1.4 Standard) überhaupt zum Laufen zu bringen - und das an Arbeitsplätzen mit nur einem Schirm. Wenn überhaupt, so klappte das meist nur mit reduzierter Bildwiederholrate von 55 Hz oder gar nur 30 Hz - unter Linux wie unter MS Win. Weniger Probleme hatten Anwender dagegen bei Verwendung eines Displayports - aber genau einen solchen Anschluss bietet nun die Gigabyte GTX 750 TI nicht. Da sah ich doch ein erhebliches Risiko auf mich zukommen. Dell 2515H parallel mit zwei 1920x1200 Karten an der GTX 750 TI unter Linux? Ein gutes HDMI Kabel. Ich habe mir ein ca. 13 Euro teures Delock Kabel geleistet, das gem. Spezifikation u.a. Übertragungsraten von bis zu 10,2 Gb/s und Auflösungen bis zu 4096x2160 px unterstützen soll. Mein erster Versuch, auch nur einen weiteren Schirm zusammen mit dem DELL U2515H zum Laufen zu bringen, scheiterten allerdings. 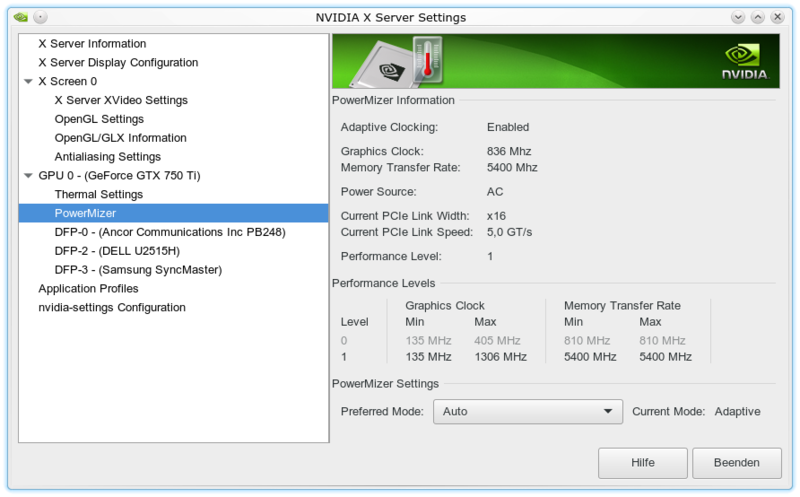 Ich nutzte und nutze zur Grundeinstellung Nvidias "NVIDIA X SERVER Settings"-Applikation und dort den Punkt "X Server Display Configuration". "KDE Systemeinstellungen >> Hardware >> Anzeige und Monitor"
Raus aus KDE auf ein Konsolterminal >> init 3 >> Neuinstallation des proprietären Nvidia-Treibers bei angeschlossenem Dell-Schirm am ersten HDMI-Ausgang der Graka (und den beiden anderen 1920x1200 Monitoren an den 2 DVI-Ausgängen) >> Reboot >> Start KDE >> Nvidia-X-Server-Einstellung => - und siehe da: Die volle Auflösung wird seitdem angeboten. Dort bleibt links und rechts ein schwarzer Streifen am unteren Bildrand. Der findet sich auf den Schirmen selbst natürlich nicht (s.o.). Auf die Unterschiede in den bildlichen Darstellungen würde ich nicht zuviel geben - die Kamera sieht anders als das menschliche Auge und die Schirme sind unterschiedlich eingestellt. Subjektiv finde ich, dass der Dell kleine Farbnuancen und filigrane Bildstrukturen bei etwas heruntergeregeltem Kontrast sehr gut wiedergibt. # generated from data in "/etc/sysconfig/mouse"
ModelName      "Ancor Communications Inc PB248"
BoardName      "GeForce GTX 750 Ti"
Option         "metamodes" "DVI-I-1: 1920x1200_60 +0+0, DVI-D-0: 1920x1200_60 +1920+0"
Der dort erscheinende Ancor Schirm - eigentlich ein ASUS PB248Q - ist der primäre Schirm; die anderen Schirme (Dell U5215, Samsung 244T) sind über die xinerama-Konfiguration in den nahtlosen "Screen0" mit einer Breite von 6400 px integriert. Dies ist bei zwei Schirmen noch anders. Da reicht eine geringere Leistungsfähigkeit. Woran immer der Nvidia-Treiber den Leistungsbedarf misst und welchen Grenzwert er dabei für die Höhertaktung beachtet. Die Lüfter-RPM steigt aber auch bei der höheren Taktung nur unwesentlich an. Im Office- und Entwicklungseinsatz, bei einer aktuellen Zimmertemperatur von ca. 26 Grad Celsius und geschlossenem Gehäuse liegen die GPU Temperatur bei ca. 41 Grad und die Lüfter RPM-Werten um die 1650 (Speed 33%). Die hohe Auflösung des Dell U2515H - wo macht das was aus ? Nun noch ein paar Worte zu den unterschiedlichen Auflösungen - besser zu der extrem hohen Auflösung des Dell unter 25 Zoll. Das erste was hier zu sagen ist, ist dass ein 25 Zoll 16:9 Schirm in der Höhe etwa 1 cm kleiner ist als ein konventioneller 4:3 24 Zoll Schirm. In der Breite gewinnt man dagegen knapp 3.5 cm. In der physikalischen Ausdehnung fällt der Unterschied zu einem 4:3 24 Zoll Schirm also nicht sofort ins Auge (s. auch das Bilder zu den Schirmen oben). Demzufolge hat die doch deutlich höhere Auflösung bei gleicher Schrifteneinstellung spürbare Auswirkungen auf die Font-Darstellung. Das Bild ist gestochen scharf - aber die Schriften sind erwartungsgemäß deutlich kleiner als auf den 24 Zöllern mit 1920x1200. Nun sehe ich auf die Schirmdistanz auch in meinem Alter noch recht gut. Dennoch : Kleine Fonts sind anstrengender als große. Leider bietet KDE bisher keine Möglichkeit, Schriftfonts schirmspezifisch einzustellen. Wo kommt das beim Arbeiten unter Linux zum Tragen? Auf der Desktop-Oberfläche kann man innerhalb der eingesetzten Plasmoide in vielen Fällen bzgl. Symbol- und Schriftgröße nachregeln. Kein Problem macht auch das Arbeiten mit Dokumenten oder dem Browser - hier kann man nahtlos und individuell skalieren. angegebenen Tools für PDT nicht. Selbts wenn sie es täten - eine individuelle Font-Regelung pro geöffnetem Eclipse-Fenster gibt es zur Zeit leider genausowenig wie ein Reinzoomen in den Code eines Eclipse Fensters. Man muss also Schriftgrößen für die Code-Darstellung wählen, so dass man in den Eclipse-Fenstern, die am Dell angezeigt werden, noch gut lesen kann, auf den anderen Schirmen aber nicht zuviel Platz verliert. Mit 12-er Fonts kann ich im Moment ganz gut leben. Wirklich komfortabel ist das aber nicht. Der Request bzw. Bug zu Eclipse, in dem eine Editor- und Window-spezifische Zoom-Funktion gewünscht wird, hat nun leider schon einige Zeit am Buckel, ohne dass etwas Greifbares passiert wäre. Ich habe auf allen unseren Opensuse-Systemen unter KDE immer wieder ein Problem mit den proprietären Drivern von Nvidia, die das Tearing der Kanten von schnell bewegten Fenstern betreffen nach dem KDE-Start. So erfordert eine tearing-freie Darstellung oftmals einen manuellen Switch in den OpenGL-Einstellung der KDE "systemsettings" (z.B. vom Raster-Modus auf Native oder auch von OpenGL 2.0 auf OpenGL 3.1). Den Einstellungswechsel man danach sofort wieder rückgängig machen. Es ist, als ob die Karte sich erst dann wirklich auf die vertikale Synchronisierungsfrequenz einstellt, obwohl das in den KDE-Einstellungen eigentlich bereits vorgegeben sein mag. Initial beim KDE-Start ist vollständige Tearing-Freiheit jedenfalls nicht für alle Typen von Fenstern gegeben. Zumindest nicht so, wie es ein (nachfolgender) manueller Einstellungswechsel bewirkt. Nvidia Treiber, KDE-Plasma-Desktop 4.14, Tearing-Effekt: Triple Buffering einschalten! Zwei unserer älteren Samsung 244T Schirme haben beim Einsatz an Linux-Systemen unter KDE bereits das Problem bekommen, dass sie eine Weile (ca. 1 Stunde) nach Abschaltung durch die KDE Stromsparfunktionen nicht mehr hochzubekommen sind. So flackert auch die Statusleuchte danach unkontrolliert. In der Phase bis dahin blinkt de Leuchte regulär. Einer der Schirme wurde daraufhin bereits zweimal repariert. Der Schirm, der das Problem aktuell wieder hat, ist nur nach längerem Abschalten, einem Reset und ein paar Tricks wieder zum Leben zu erwecken. Die Probleme liegen in der Schaltelektronik, nicht am Panel selbst. Es tritt übrigens nicht auf, wenn man den PC regulär runterfährt. Auch dann schaltet sich der Schirm ab - er schaltet sich dann aber beim Hochfahren des PCs auch wieder regulär an. Wegen des Alters und des Recovery nach längerer Abschaltzeit mag man natürlich an defekte Kondensatoren denken. Der neue Dell tut jedenfalls bzgl. der Stromsparfunktionen genau das, was er soll.